The NY half of Small Group #6 in presents their project. I love these visuals! Today is the facilitator debrief session for the 123 VC: Jazzing Up Your Curriculum with Videoconferencing workshop. We review the summer sessions and decide on changes for next year. Learning and Leading with Technology just published an article about the Jazz Workshop. Check it out! I updated the History of Jazz post with this year’s participation. It’s interesting to see the changes over time! Remember, if you’re interested in participating, review the documents on the right side of the Jazz website. Dates and application for next year should be up in a few weeks. What excites me about videoconferencing with staff is the range of possibilities. There really isn’t an excuse for any teacher to not use videoconferencing to enhance curriculum. What excites me about videoconferencing with students is empowering them to collaborate with students from other states. Also, using videoconferencing would urge students to come to class…never know when an exciting videoconference could take place :)! 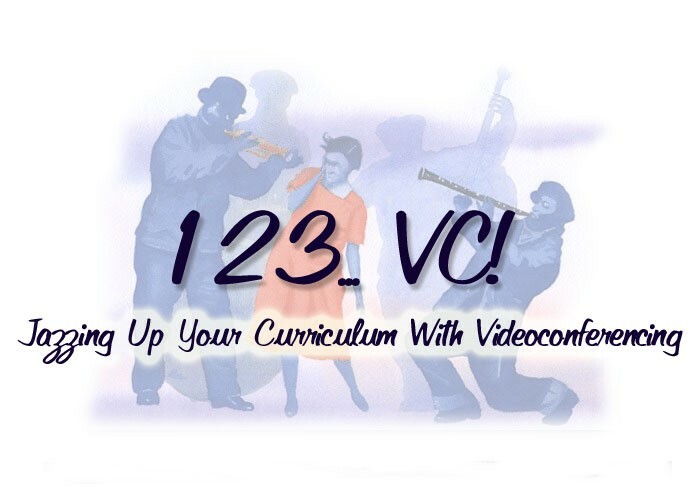 It’s the first day of another session of 123 VC: Jazzing Up Your Curriculum with Videoconferencing. I have 8 participants for this session: two high school teachers and six 1st and 2nd grade teachers. Met in small groups to get to know their group members from other states. I thought video conferencing was almost impossible to plan for in my class, but I know it is much easier than I thought. I can’t wait to see what trips I can plan for my class! At first it was mind boggling to think about how we were going to put together a presentation in 30 minutes; however, once the creative juices started to flow, it became a race to see which idea could we make the most creative. Even though I have already used some videoconferencing, already today I have seen other ways to incorporate more ideas into my current curriculum. I really like the sheet provided for recording the conferences that I might be interested in using each month. … When you are involved as the teacher, you’re so worried about your class and how they are behaving that it’s sometimes hard to notice the other small details that I had more time to pay attention to today. The amount of things to do in VC is amazing. There is more to it than I actually thought would be. It is kind of intimidating at first. But wow, what a great thing to learn and use. And, the piece I’m most excited about is that new equipment might come out of this workshop! I have a school that has dabbled in videoconferencing and has good sources of funding, but hasn’t been eligible for any of the grants we’ve written. They haven’t seen what they are missing to be motivated enough to pursue videoconferencing. But, after the exchange simulations, the three teachers from that school were ready to write a proposal for funding for a videoconferencing cart! Yay! I’ll be working with them further to get their system purchased and installed. I’m so glad!! And it’s only the first day of Jazz! What a productive day we had!! This morning Bridgman Elementary is connecting to Wales in the UK for a project that was written in the Jazz workshop this summer: Guess My Pet. Before the videoconference started, I noticed the teachers using best practice to set presets on their visuals (which were neatly mounted to hold them still). Nice to see Jazz lessons being put into practice. It’s got long or short hair. It makes a squeaking noise. It lives in a cage. It runs on a wheel. After guessing, the classes shared pictures and facts about their pets. The classes also shared a graph of what types of pets they have represented in their class. We had a few technical glitches along the way, but overall the students enjoyed the process, practiced their reading, listening, and presenting skills, and got to know students in another country! The classes plan to continue the partnership with pen pal letters between students. This post is part of a series examining articles on the communication aspects of videoconferencing. This study compared Moore’s (1972) theory of transactional distance to the use of videoconferencing for teaching at a distance. The theory is that transactional distance (the distance of understanding and perceptions) has to be overcome by the teachers & learners for effective learning to occur. Moore suggested that lower structure and higher dialogue would yield less transactional distance. Chen studied 121 participants in twelve videoconferencing classes in several subject areas. Results included that dialogue includes in class verbal communication, face to face interaction outside the class, and communication via email. The structure of the course included the design or organization of the class and also the delivery and implementation. Chen found that Moore’s theory isn’t specific enough in these areas of dialogue and structure. The students perceived greater learning from greater frequency of in-class discussion. The greater the reported transactional distance between teacher and learners, the less the perceived learning. Those were the only two factors that made a difference in perceived learning. The study also found that out of class electronic communication was not supported as an effective practice; however, by the sounds of it, the use wasn’t required and therefore was low. If deliberate, interactive, engaging discussions were set up, would this result be different? It’s interesting how important the in-class discussion was in this study. How do YOU create discussion across sites? Good models are GNG‘s Pulse programs; some of the Jazz interactions; what else? Don’t you think that many other Web 2.0 tools if chosen carefully and used deliberately could be more effective than a listserv? Of course this was published in 1997 which is seriously old in Internet time. What other things do you see as important to a videoconferencing class?